Carpet Cleaners San Antonio have all sorts of promises they say to bring in a customer. In most cases these carpet cleaners San Antonio do not or cannot keep their word. 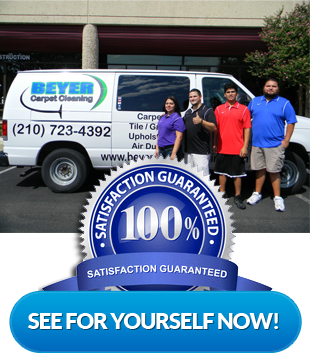 Beyer Carpet Cleaning San Antonio is a small family owned business. Beyer doesn’t answer to a big corporation and we aren’t in so much debt that we cannot offer customers great pricing. Beyer Carpet Cleaning plans on always having the lowest prices and unbeatable carpet cleaning customer service. Beyer Carpet Cleaning won’t promise you the world in case they can’t deliver on their promises so when we get the job done and get it done right their customers are over the moon! Other carpet cleaners San Antonio can’t compare to the work ethic and prices Beyer Carpet Cleaning provides day in and day out. Beyer just doesn’t perform carpet cleaning they also perform tile and grout cleaning and upholstery cleaning. Their carpet cleaning technicians are well trained in all aspects and will provide you with a professional and good looking cleaning job. Carpet cleaning can become stressful when you can’t find the right price or when a company says they’ll be at your home and never shows up or calls. Beyer Carpet Cleaning makes it habit to call their customers to let them know where the technician is and their estimated time of arrival. Their prices don’t change when they show up to your home. Their are no hidden fees or charges. Everything is explained up front over the phone while you are booking your appointment. 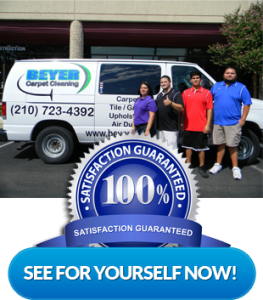 Beyer Carpet Cleaning San Antonio never wants a customer to feel cheated or feel they did not get their monies worth. Beyer always to provide the best they possible can. Too many carpet cleaners in San Antonio are too prideful to admit they made a mistake or unwilling to go back to your home to fix any issues. Beyer Carpet Cleaning offers a satisfaction guarantee to our customer who purchase their best service packages. If you are willing to spend the extra money we are willing to make you happy with the best carpet cleaning. Give Beyer Carpet Cleaning a call for all your cleaning needs.